There are two white zones around Fairmount, but only one of them should be used to drop off kids. The 1st white zone, shown in green on the map, is on Chenery at the front entrance to the school. Drop off your child on Chenery. That white zone is for dropping off your child in the morning and is staffed by volunteer parents. The 2nd white zone, shown in red on the map, is along Randall. This white zone is for school buses only. Do not drop off your child on Randall. It is a very narrow street with dangerous two-way traffic, and that space is needed for school buses. Please volunteer! We need at least 10 parents to volunteer about 20 minutes a week. It makes a huge difference for the whole school community as well as the neighborhood. Email whitezone@wearefairmount.com to help out. Use your blinkers to signal you are pulling in or pulling out. This makes it much easier on the volunteers and is safer for our community. Pull all the way forward in the white zone. Do not stop midway. Wait your turn. Do not cross over into on-coming traffic lanes, it really only takes 30-60 seconds to clear out. Do not get out of your car. The parent in the white zone will open the door and assist your child out. 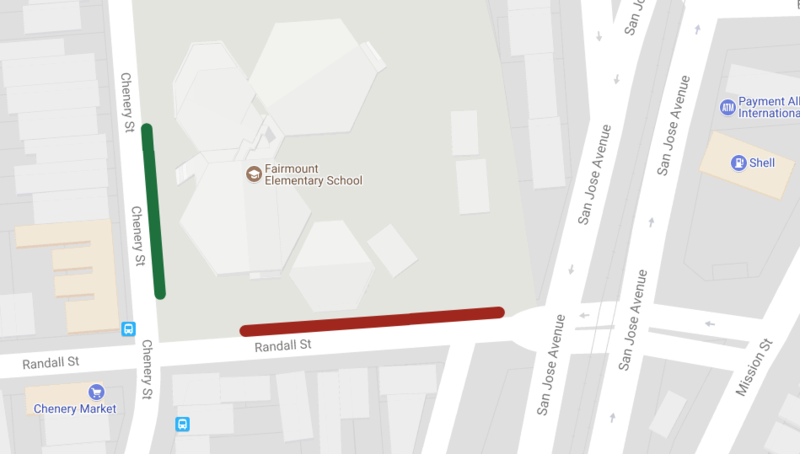 Before you get to Fairmount please ensure your child has his or her belongings, knows the pickup plan, etc. Once you are at the white zone it is time to get out quickly and safely and last minute reminders of things cause confusion. For pre-K families who are supposed to walk your child in, please find a legal parking spot. The white zone is not available to park in even for a quick minute. When you pull out (using your signal), please first look for bicyclists and other cars and then continue all the way to 30th street. 3 point turns (particularly right in front of the school) are exceedingly disruptive and dangerous given the visibility at that particular stop. Go to 30th and turn left or right, depending on your final destination. For the afternoon, do not ever, for any reason, double park on Chenery or park in the white zone on Randall. Please find an empty parking spot and walk back to the school to pick up your child. We’ve had numerous close calls and at least one child actually hit, when it is nutty in the afternoon. A two block walk is usually the most you would have to do. Thanks.